If you ever wondered if Google looks down upon websites that use questionable font choices, such as if a website decides to use Comic Sans, the question came up in the latest Google Webmaster Office Hours. More specifically, whether Google takes font choices into account when judging quality, such as whether hand written dont type would lead Google to treat the content as not as serious as similar pieces of content in other font types. No, as far as I know, we don’t do that at all. So if we can crawl the page and see the content, then that works perfectly fine for us. The only situation where I could think of this being a bit tricky is if you are using images instead of text on a page, then obviously us doing OCR over the images is hard on its own, and as far as I know we don’t do that at the moment. On the other hand, if we have to do OCR over handwritten images, then that essentially makes it impossible for us to find out anything. So if you are using normal text and are just swapping out a fancy font because that is kind of your corporate style, or you just feel like using a fun handwritten style font, then that’s totally up to you. That’s not something that we would demote a website for or assume it’s to be taken less seriously. So feel free to use Comic Sans if you want, feel free to use kind of a more corporate type font if you prefer, that’s totally up to you. That said, font choice and certainly impact user experience. If you are a professional website selling products or services, then Comic Sans as a font choice would leave many people to feel that it is a fake site or one that is seriously outdated, unless perhaps you are a daycare center. And as OCR evolves, as everyone feels it will, it could have an impact further down the line if you are using handwritten or super stylized fonts in images, if OCR is not able to understand the fancier or heavily stylized fonts used in images. 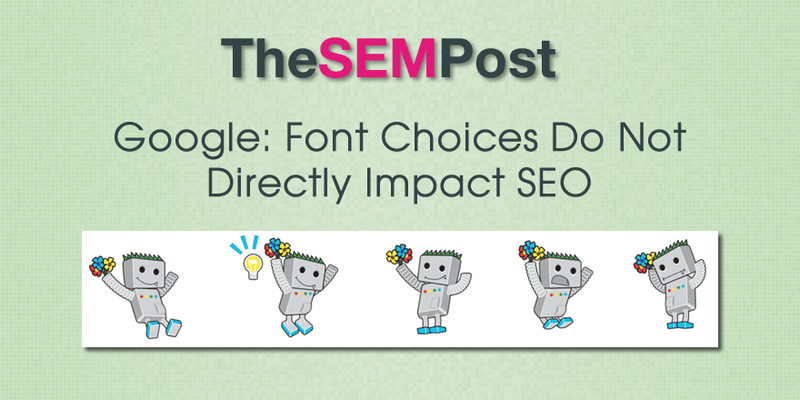 So before you decide to go fancy with your fonts, make sure from a user experience that it conveys the right impression for your site visitors, even though font choice doesn’t directly impact SEO. Thanks for the update. Fonts are often overlooked, certainly from a UX point of view. Would you say the font family and the different selected styles used on a website could impact website speed? And with that the choice of font could indirectly have an influence on your overall website performance? We can see that by specifying three different types of Roboto the load time is moderate. So the font itself doesn’t affect load time, but the amount of font types of 1 family loaded at once has an impact on load time. Does this also count for the load time of a website? Curious to hear your thoughts on this subject.